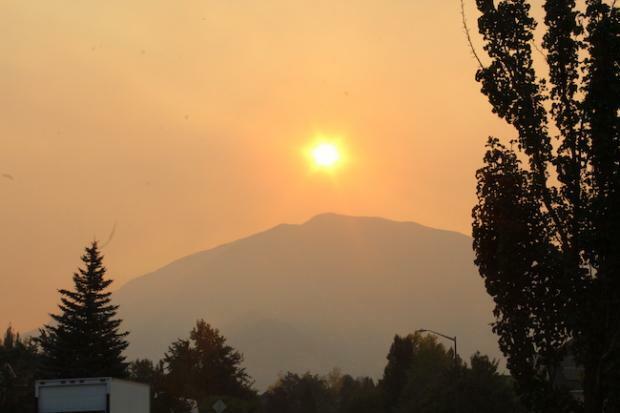 The Pole Creek Fire that began September 6 is making its way toward cities in Utah county and residents in the southern cities have already started to evacuate. Reports have stated there is a heavy layer of smoke covering the valley. Last night I could see the glows of the fire burning on the mountain and this morning I awoke to the smell of smoke. Parts of Spanish Fork, Payson, and Salem are on pre-evacuation protocols as the fire heads north. Officials are preparing for the Pole Creek Fire and Bald Mountain Fire to merge sometime in the near future, according to reports. The Pole Creek Fire is currently covering 54,000 acres and Bald Mountain is at 14,500. As a result of the fire moving dangerously closer to the bigger cities, UIAAA was cancelled. About 11 schools have been impacted by the fire so far. It has been also confirmed that the BYU meet will not be held at the Easy Bay Golf Course in Provo. Instead, it has been moved to Logan. Updated race information can be found here.